Originally published as "Winning the Fight for Progress-- North Carolina's Antebellum years begin: 1830-1850"
In 1820, a New York author named Washington Irving published a story about an old man named Rip Van Winkle, who fell asleep for twenty years while the world changed around him. Before long, visitors from out of state were calling North Carolina the Rip Van Winkle State. These people thought that Tar Heel leaders were "taking a long nap" from supporting needed changes in transportation, education, and farming, while some states in the country were making great progress in those areas and more. North Carolina fought this unflattering image from about 1830, when reforms and changes began to take place, until 1861, when the Civil War began. Historians call these years of relative growth and prosperity the antebellum years. These were exciting years in American history. New inventions like the steamboat, the railroad, and the telegraph began moving people, goods, and information faster than ever before. Immigrants were pouring into the nation’s cities. Pioneers were streaming across the Appalachian Mountains to settle the lands beyond. Democracy was expanding rapidly as new groups of citizens were getting the right to vote, and political parties and political campaigns began boiling with new energy. Religious revivals were transforming America’s churches, and enthusiastic idealists were planning new ways to improve society. Reformers were starting programs to free slaves, bring equality to women, end the abuse of alcohol, change the treatment of criminals, establish public schools, and improve the lives of those who were poor, blind, deaf, or mentally ill. While many of these activities were beginning to take place elsewhere, North Carolinians who wanted reform at home felt change was coming too slowly. They felt the state seemed backward and poor. North Carolina’s backward image stemmed largely from an inadequate transportation system. In these years, the easiest and cheapest way to move people and goods any distance was by boat. But rivers in North Carolina, especially above the fall line, were not easily navigable because they were shallow and often blocked with rocks, rapids, and sandbars. Even if a boat could reach the coast, the Outer Banks blocked access to the ocean and created treacherous sailing conditions for ships heading for other states or for Europe. The only other ways to travel at the time involved using roads that were so muddy and rutted that it could take weeks for a farmer to haul his produce to market with a horse and wagon. Slavery was another major factor contributing to North Carolina’s Rip Van Winkle image. The "peculiar institution" of slavery was very widespread in antebellum North Carolina and the other southern states. In fact, by the end of the antebellum period in 1861, more than one out of every three North Carolinians was an African American slave. 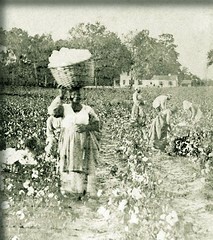 Enslaved persons often labored on large farms, or plantations, on which they worked to raise cash crops like cotton, tobacco, and rice for their owners to sell for a profit. Most of these plantations were located in eastern North Carolina where nearby rivers and seaports made transporting the products somewhat less expensive. Other slaves worked on medium-sized farms and in homes and workshops throughout the state. Generally speaking, slaves were least common in the west, where poor transportation networks slowed trade. Slavery created many problems for North Carolina. First, the slaves themselves often suffered from overwork, poor food and living conditions, harsh and painful punishments, separation from family members, and the denial of schooling. In addition, slavery hampered the North Carolina economy, even though its use was a profitable way to grow crops. Slavery promoted "growth" but not "development." In other words, slaveholders tended to use their profits to buy more land and more slaves and to grow more and more of the same kinds of crops (that is growth). But they did not experiment much with improving machinery or methods and diversifying to other industries or businesses (that would be development). Almost every year, owners’ plantations grew a little larger and their harvests more plentiful (those are results of growth). But cities did not flourish, technology did not advance, and new skills and education spread slowly (those would be results of development). As a result, North Carolina and other southern states fell far behind the level of economic development in the northern free states. Most white families, however, lived on small farms without slaves and often far away from good transportation routes. Unlike plantation owners, they could not live by selling their crops to others, because the long and costly trip to market might cost more than profits from the journey. Moreover, if they concentrated on raising market crops like cotton or tobacco, they had to worry that a sudden drop in the market price might leave them without enough money to buy food. Instead of raising crops to sell, these families focused on raising just enough corn and pork to feed themselves. At year’s end, they could sell what they had left over to buy the things they could not make. Historians call these farmers "yeoman," or subsistence, farmers. Subsistence farmers lived all over North Carolina, but they were most numerous in the more isolated backcountry to the west. They lived very simply, often in log cabins with a single room, and dressed in homespun clothing. The whole family worked together to operate the farm. When tasks grew too heavy for the labor of one household, families helped neighbors by sharing work in quilting bees, barn-raisings, and cornhusking frolics. It was a hard life, but yeoman farmers who owned their land and stayed out of debt did not have to raise cash for landlords or bill collectors. They treasured the independence that subsistence farming offered them and could be very suspicious of changes that might put them under the control of more powerful people from far away. Even if they became dissatisfied, most farmers and planters did not think about change. Land farther west was still too plentiful. They could decide to move away. The opening of new lands in Tennessee, Alabama, and Mississippi tempted many white North Carolinians to try their luck in other parts of the country. There, they hoped to leave behind North Carolina’s worn-out fields and to find richer soil on which they could better grow their crops. They also hoped to find deeper and more easily traveled rivers on which they could move their products more cheaply and efficiently. Others sought new homes in northern states like Ohio, Indiana, and Illinois. They went north for the same reasons and more: In the North, slavery was illegal. Finally, a few North Carolina leaders began to act to change the image of the Rip Van Winkle State. They wanted the state to build new roads, canals, and later railroads to open up isolated areas. They wanted to create a public school system to bring education to more people and to start reforms that could improve the lives of North Carolina’s unfortunate citizens. Other reformers tried to make politics more democratic and to give more men the right to vote. A few even wanted to do away with slavery, but those efforts were weak and very unpopular with white citizens. These reform plans were controversial in antebellum North Carolina, because the wealth and political power in the state were concentrated in the eastern section where transporting goods to market was not so difficult and slave labor was deeply rooted. The biggest problems with transportation and poverty were in parts of the western section, the backcountry and Mountains. Building railroads and schools there would be expensive and would have to be supported by higher taxes across the state. But eastern North Carolina taxpayers did not want to pay higher taxes to benefit the west. Even in the west, some yeoman farmers did not support reforms. They worried about high taxes and wondered if the new railroads might end their independence along with their isolation. Other yeomen disagreed and welcomed the chance to make more money by shipping cash crops to market. Politicians fought long and hard over reforms because people in one section, east or west, often did not understand or care about situations in the other. But reformers argued that progress would be good for the state as a whole. LearnNC, Antebellum North Carolina: http://www.learnnc.org/lp/editions/nchist-antebellum/. DocSouth: Antebellum North Carolina: http://docsouth.unc.edu/nc/johnson/chapter25.html. LearnNC, Social Divisions in Antebellum North Carolina (see for Yeoman Farmers): http://www.learnnc.org/lp/editions/nchist-antebellum/5601. Starkweather, Sarah. "Coit Tower2: Yeoman Farmer." April 19, 2007. Located at http://www.flickr.com/photos/sarah1rene/470672974/. Accessed on March 2, 2012. 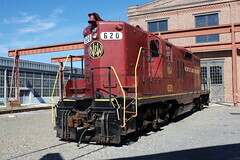 "2009-10-08 14-13-51 - 0054 North Carolina Transportation Museum." Spencer, NC. October 8, 2009. Located http://www.flickr.com/photos/railsr4me/4011883085/. Accessed on March 2, 2012. Friesel, Rob. 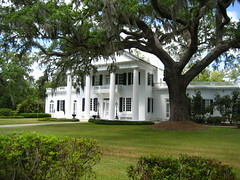 "Orton Plantation." Kendall Chapel, NC. May 15, 2007. Located at http://www.flickr.com/photos/found_drama/505430291/. Accessed on March 2, 2012. Feliz, Elyce. "Cotton is King." Feliz, Elyce. October 9, 2011. Located at http://www.flickr.com/photos/elycefeliz/6225612437/. Accessed on March 2, 2012. 1 January 1996 | Watson, Harry L.
Thank you for the info!It really helped with my AIG assignment! Thanks for letting us know! I'm glad NCpedia could help.